I’ll be attending my sister’s graduation out of town in the next week, so I’m taking a little break. New pages will be up before the end of the month. i think it would help us to know what her research has all been about. does she actually have samples from the bug planet??? i thought that’d be forbidden. hmmm. i hope it’s not a false start. but. it might be. I actually haven’t been able to get to into this in-comic, so here’s some backstory stuff! Mariam is a xenobiologist, so at this point she is studying the physiology of the bugs. She would obviously be the first to know about the disease. 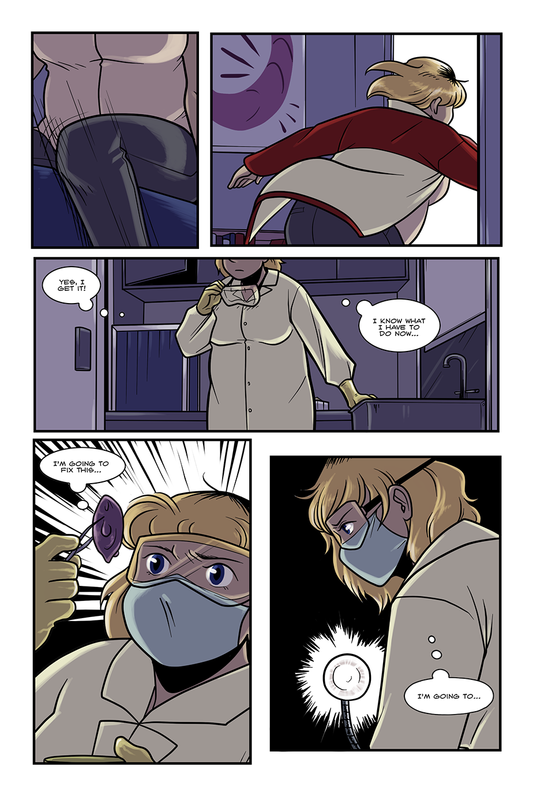 The “glob of science” she’s looking at in this page is a diseased sample. The drones are difficult to make and very expensive, and they are one of the resources the station is currently running low on. oh, thanks for the info-dump! I was wondering about how that works. thanks! helps a lot, actually. do the drones take pictures also? i feel like we’re definitely going to get a visual on Eve down there at some point, and then all hell will break loose. I’m actually surprised it hasn’t happened yet.